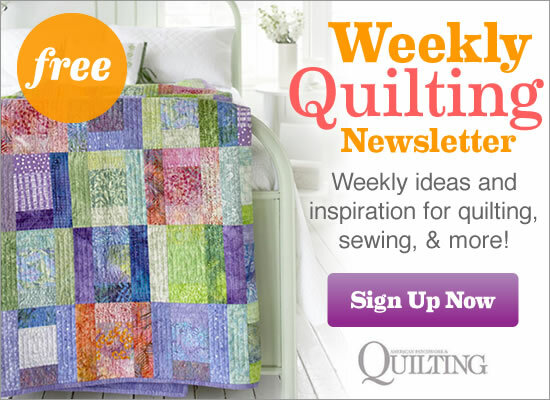 See the featured quilts and web-exclusive color options and projects from the American Patchwork & Quilting February 2014 issue. The February 2014 issue of American Patchwork & Quilting is on sale from December 3--February 3. A creative explosion was the result when four quilt designers took on a project that pushed all their personal boundaries. Use their story as inspiration to plan your own encounter. See their four quilts here. Use a Midas touch to turn a classic Lily block into daffodils. Petals in bright gold prints beam and light gray stems add unexpected softness. Bold prints keep this take on Golden Opportunity fun and fresh. The floral and geometric prints mix effortlessly to add texture and contrast with the border and setting squares. We love handwork and you can, too! Learn to love the process as you hand-stitch parts of this clever patchwork pillow. Put a classic twist on this modern pattern by using reproduction fabrics. Pinning carefully and stitching slowly, Laura completely machine-pieced Heart's Desire. She fussy-cut a stripe vine so it would continue uninterrupted to perfectly frame the lettering in the LOVE block. Pinwheel blocks on point set this simple, reproduction-print throw in motion. With 400 different fabrics, it's a scrap-saver's delight. For her wall-hanging version, quilt tester Laura Boehnke chose deep, rich batiks in inviting earth tones. She used the subtle shifts in the brown batik setting pieces to provide an interesting framework, concentrating medium-brown setting squares in the center of the quilt, creating a frame of darker brown setting squares, and ending with setting and corner triangles in a third brown batik. Scrappy quilts don't have to be made from fabrics that compete for attention. Learn the tricks to low-volume quilts from one designer's experiment. Join the Quilt Along for this quilt. Take Tone It Down from scrappy to just five fabrics for a cool blue wall hanging. Skinny chains of light, medium, and dark blue squares run through a cream marble background, mimicking the blue veins in the cream marble print. Big pieces allow big prints to shine. Choose your favorite fabric to feature, then add borders and sashing for a simple, bold table runner. Create a dramatic, global-inspired table runner from a mix of paisley and geometric prints. Designer: Victoria Findlay Wolfe of Bumble Beans Inc.
A quilting mix that includes ethereal feathers and graphic zigzags transforms simple rectangles into a stunning king-size bed quilt. Don't be afraid to put your own spin on this geometric pattern. Draw inspiration from the Southwest and transform the modern design into a comfortable throw. Our palette includes the myriad colors you would see in a Grand Canyon sunset. Floral prints and polka dots are the stars here. A pieced Lone Star explodes from the center, surrounded by machine-appliqued flowers and buds. Instead of appliqued blocks, feature a bold print in the corners of a jewel-tone throw. Orange and red prints in the Lone Star draw attention while the blue tone-on-tone background recedes, resulting in a quilt center that looks like a kaleidoscope. Simple to fuse and sew, this crib quilt is sure to catch the eye of modern moms and their tiny tots. Double your use of circles in a wall hanging that showcases fussy-cut circular motifs stacked on rings in a variety of fun prints. Swing into 1960's London with a mod Union Jack-style throw. Fabrics filled with color and soul are anchored by solid geometric pieces. The mix of light and dark prints in this quilt has a surrealist effect. The Union Jack-inspired pattern takes a backseat to vibrant, rich hues that meld and mix for a statement throw.